Cricket Communications Inc., one of the leading wireless services provider, announced the first ever to offer unlimited music on a fixed wireless rate plan. The new innovative digital music service is tagged as “Muve Music” which will mark its debut at the upcoming Consumer Electronics Show (CES) 2011 in Las Vegas. According to company officials, Muve Music service would be the first music experience specifically designed for the mobile phone. The company feels excited to share the mobile music experience, connecting fans to the artists they love in a unique and innovative way. Cricket was the first to introduce an unlimited wireless rate plan and now we are the first to introduce a new unlimited wireless rate plan that includes unlimited music. With Muve Music, Cricket is bringing together the best of wireless and music in a way no one has ever done before. Our recent experience with smartphones has shown us that the right products offered at the right price will be successful with value-oriented customers. We are excited and confident that Muve Music will provide a superior mobile experience for customers who want to create a personal music experience without being tethered to a computer. The result of our collaboration with the music industry during the past two years allows unlimited music downloads, ringtones and ringback tones to be included in a wireless service for a flat monthly rate. We believe the high quality Muve Music experience is the right product at the right time for value oriented customers. Muve Music include a catalog of music content which includes music from four major record labels, including Universal Music, Warner Music, Sony Music Entertainment and EMI Music. 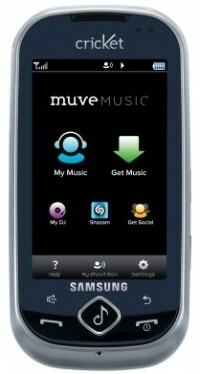 I give the cricket muve music phone(samsung suede), lets start at a 10. First off, you do get unlimited ringtones and songs which is just awesome.TEN. Unlimited Ringback Tones seems a little off to me when you can only download a select few ringback tones.EIGHT.Because, of the simple fact hardly any songs have the ringback option. FINAL RATING 3.5/10 3.5 just for the ringtones and song downloads.